In the month of February we spent NZ$ 2019. The biggies were Phil's doctor bills for his fractured toe ($280) and our little break from Sophia while going backpacking wasn't cheap either, so far it was $435. And this is only the first part of our trip, the whale sharks trip and my freediving course occurred in March. I have gathered all the costs for the land travel under sightseeing, rather than divide it into eating out, transport etc. I have deleted the item Drinks and food for internet, as we haven't had any costs there since Vanuatu and I don't think we will anytime soon. 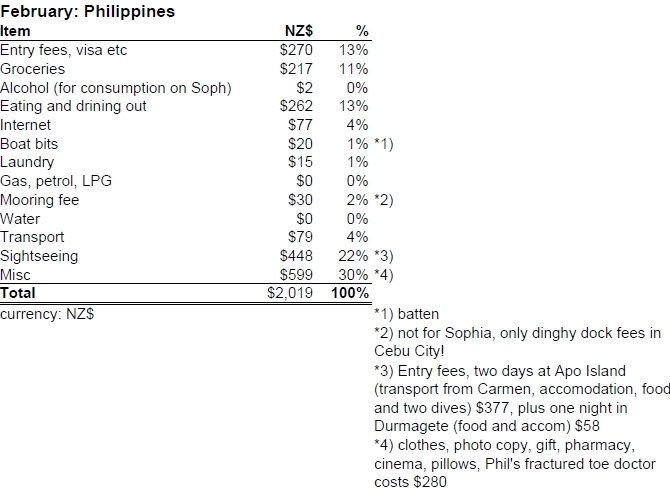 We haven't had much transport cost before now, and even though transport in Philippines is very cheap, we have travelled a lot on land and in cities and it all adds up. Very interesting is we actually spent more on eating out than buying food in February!! That's for sure a first! It means we have eaten out A LOT, but it has still been really cheap, considering how many days we have eaten out!